For the 2013 season I will be regularly covering the new MSV and BRDC backed Formula Four series. If any drivers and/or teams require coverage, please contact me promptly. 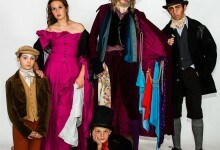 Promotional photo for Rackheath Youth Theatre’s production of Oliver. Taken against a white paper backdrop in one of the rooms at Rackheath Village Hall. 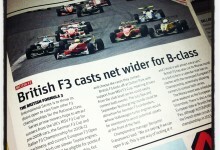 Here is one of my photos featured alongside a British F3 story. It was taken at the F3 Cup meeting at Silverstone early in the 2012 season. Leading pack is Enigma’s Linton Stutely, CDR’s Chris Dittmann, Omicron Motorsport’s Tristan Cliffe and Louis Hamilton-Smith on the right hand side. 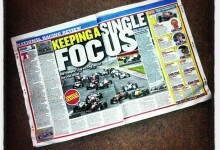 I found my F3 Cup start line shot from Silverstone being used in the 5th December 2012 issue of Motorsport News. I think this is the largest photograph I’ve had in the press. The largest picture I’ve had reproduced has been on the side of a race truck!